This article has been a long time coming and for several reasons. There was a time when I was learning trading in crypto where I was doing well with the basics of candlesticks, relative strength index, and patterns to trading. But there was a time that I was venturing into the many different ways people trade using other indicators, trading styles, and even bots. Some of my favorite and most profitable styles have been using the 9/20 exponential moving averages in conjunction with each other and fine tuning the deeper layers of using RSI. One indicator I discovered was called the Aroon. There are some basic articles on it but I’ve rarely seen it used with stocks and forex and for crypto Ive only seen it used once as a joke. I played around with it and got very comfortable with it. And then it started to really improve my understanding of the coins and the profitability of my trades. It also is easier for me to understand personally as the Aroon lines are more triangular instead of sine waves (basically I do better with rough lines instead of smooth lines to calculate data). I would like to thank everyone for the growth I’ve recieved in the past two months as many have became interested in my trading style and information. I’m especially humbled because some are even those I’ve looked up to in trading myself. Part of the reason for this article is a result of Aroon being so popular that many are wondering how I use it, or how its used in general. I’ll start with the very basics of how to read it . The Aroon Indicator was invented by Tushar Chande. Aroon means “Dawn’s Early Light” in Sanskrit and was designed to be an indicator to identify incoming trends before they happen. So right here we are shown two different lines, a red and a blue. There is a slight learning curve to this, so let me explain. Basically these lines take previous previous highs and lows. The red line is called the Aroon Up line. This is used to calculate the a certain number of days from its “all time high”. So for example, lets say you pick a duration value of 10 on the 1D Bitcoin chart. The Aroon Up will calculate the a formula between how long its been since Bitcoin has seen its highest high within the past ten days. The formula looks like this: ((N — Days Since N-day High) / N) x 100. And yes, the color is red for going up, not down as you would expect). The blue line is called the Aroon Down line. This is used to calculate the number of days from its “all time low”. Its just like the Aroon Up line but calculates the opposite. However, this will come with a third layer of indication which I will explain later on. Lets see how that operate individually in action and afterward place them together. Now that we have a good primer on the General way to read the Aroon, we are able to use it for trading to gauge what it’s meant to read. We can read the indicators from each like to get an idea about price action. Let’s look at the above picture first to see the Aroon Up and how it reads what the price is doing. Looking at the Aroon Up line we can see the first balloon of texts. As you can see, the Aroon Up is at the bottom of the spectrum with a reading of 0. This is because of the price action highlighted in red above it, which covers the past 14 days of this Bitcoin chart. The reading indicates that no local high was created within that 14-unit span. You can compare to the 14 day period in red and see there has been no local high in that time. You may be wondering about the higher high midway through the span. This wasn’t counted because of the trailed span at the time the candle was created — basically it wasn’t a local high when it was produced. The next red 14-unit span covered a top of the range of Aroon Up, fixed at 100. Taking a look at that span, we can see no bullish candle was created at that point until then, hence the reason for the reading. In the chart, the bullish price action eclipsed the bearish opening from the beginning of the span but this is not what the Aroon picks up. It compares the new local high from the previous high, not highs/lows or lows/highs. Special Note: the standard for the Aroon, which is typically what I use, is 14 units (14 days, 14 hours, etc). You can adjust the settings to get different results. A higher unit should yield identification of trend peaks while smaller units can be used for potential scalps. The Aroon Down line in action is very similar to what your likely thinking — it takes the same actions into consideration that the Aroon Up line did but with the opposite effect. On the chart, the first blue 14-unit span shows on the Aroon Down indicator like that it has reached 0. As you would expect, that means it’s been 14 days (units) since last local low of that span. It’s always a trailing span. This can result, as in this case, for price action to be at a local high, but it’s not always the case and not designed to be read effectively like this. It really just takes into the consideration that no local low has formed in 14 units. The opposite is true with the next blue 14-unit span, as Aroon Down has reached a peak of 100. As you can see, this resulted in a new local low. You can also see thereafter that the Aroon Down kept touching the peak, which shows momentum of a downtrend. They do much more together however…much much more. For example, the first picture shows what a pattern on a chart will look like when the Aroon Down and above the Aroon Up, but they are both traveling downward. This helps to decease the strength much in the way that values decrease. For example, if Aroon Down represents 100 and Aroon Up represents 50, dividing them both by have makes them 50 and 25 respectively — yet this will have more effect on the Down value because it lost half of its total strength versus the Up which, although lost half its strength as well, didn’t have full strength to begin with. Thus a bluish candle should appear. The second pictured, once again the opposite of what you would expect. When the Aroon Up is dropping parallel with the Aroon Down, this causes a drop for a downward consolidation or downward trend. Special Note: if you confused why price is going up or down and the Aroon isn’t showing the consolidation effect, that’s perfectly normal. There are other components involved like if the lines are floored or peaked. I’ll try to cover these in a more advanced article. They can also show my favorite, crosses. These are price movements that have been floored and ready to move upward to create more volatile price action, either upward or downward. These can typically be see if a new trend is coming. In the example above, we can see the Aroon lines where I have my comment bubble and where the Aroon Down has crossed through upward on the Aroon Up. This shows on the chart above it how it’s affected. As you can see there was a huge drop. From the Aroon perspective this is because the price action value on the Aroon Up has decreased signaling the end of any local highs on that time span, and a new local low on that same frame. This happens a second time on that same chart. As you can expect, the opposite will take place when the Aroon Up crosses above. Aroon Down cross is what I simply call a bearish cross. An Up cross is a bullish cross. These can also have stronger effects based on how high and fast they go up. In the first example, a long position is shown. You can see on the Aroon where I have a comment bubble that a cross took place. The day before entry you could take a potential positions (use your own risk management and application) and the next day after it crosses, the results on the chart give you a yield of over 11%. The second example is a short position. It shows that the candle before the cross maintained support on the trade but was about to cross anyway. Taking the bearish cross to short would give profits of approximately 19%. Not bad for two lines. The Aroon is a very uncommon indicator that I have received a lot of questions on since I have adopted it. I hope this article has served you well. 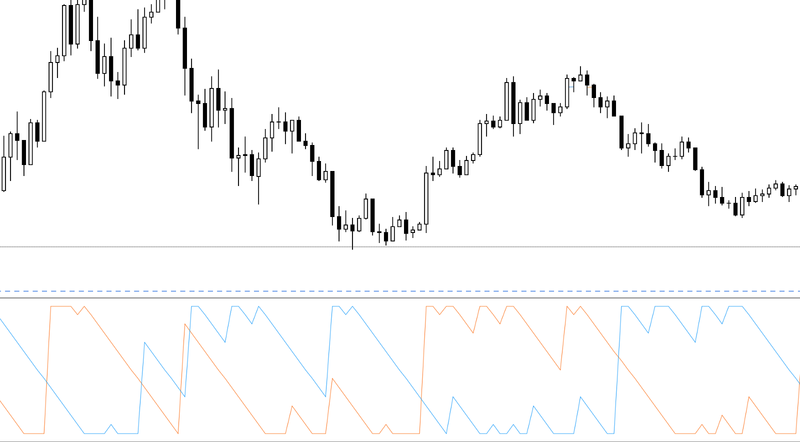 My intention is to make a second article to show how this can used in correlation with RSI overlapped (this is what I use currently) and other advanced features. Crypto Otsukimi is a Writer and Analyst that is passionate about all things crypto and tech. His formal research experience made it possible to be a self-taught cryptocurrency trader. Otsukimi focuses a lot on technical and fundamental analysis, with a practical emphasis on how crypto is an ethical step forward in finance and technology. Some of his background includes professional photography, mobile development and trading bots, and planning humanitarian projects in Southeast Asia. Previous Want To Become A More Profitable Trader? Good. Start Writing It Down!